In 2013 the global feed indsutry comprised of 28,200 feed mills, according to the latest data published by ALLTECH as part of their annual feed survey. 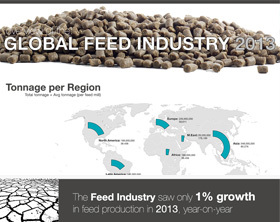 To help visualize the data, and provide an overview of global feed production in 2013, we have created the following infograhic. Feel free to use this infographic on your site, please follow the instructions below and provide a link back.